Situated between Destin and Scenic 30A, Miramar Beach, Florida provides classic coastal living with scenic beach roads, surf shops, fabulous restaurants, beachfront homes and condominiums with panoramic views of the Gulf of Mexico. In Miramar Beach, you’ll find beaches and nature areas that are less populated, allowing you to truly enjoy the beauty of the Emerald Coast. 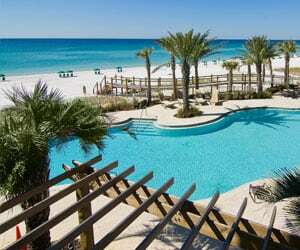 Two of the top resorts along the Florida panhandle are located in Miramar Beach, Sandestin Golf and Beach Resort and TOPS’L Beach & Racquet Resort. 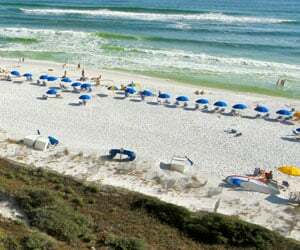 Sandestin Golf and Beach Resort is currently the #1 resort on Florida’s Emerald Coast. This beautiful 2,400 acre property includes a variety of vacation accommodations, white sand beaches, full beach services, golf, tennis, water sports, Sandestin Marina, fitness center, spa, biking and walking trails. The Village at Baytowne Wharf inside Sandestin is a pedestrian Village with shopping, dining, events, and entertainment. The Nathan Abbott Team recommends visiting Grafitti & The Funky Blues Shack at Baytowne Wharf for eclectic family dining, local musical entertainment and bay views. 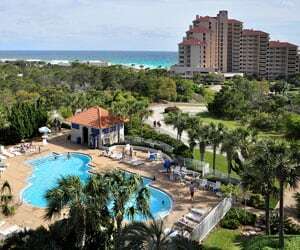 TOPS’L Beach & Racquet Resort is the neighboring property to Sandestin Resort in Miramar Beach and includes Gulf front condominiums, town homes and private residences that back up to Topsail Hill Preserve State Park. This smaller development provides a more intimate setting while still providing incredible amenities. Miramar Beach is also home to the nation’s largest designer outlet center, Silver Sands Premium Outlets. The outlet hosts an array of national retailers including Saks Fifth Avenue Off 5th, Banana Republic, Polo Ralph Lauren and more. Silver Sands restaurants include Carabba’s, Cheeseburger in Paradise, Panera Bread Company and local Ciao Bella’s Italian Restaurant. Miramar Beach has many wonderful restaurants, ranging from locally owned bistros to national chain restaurants. The Nathan Abbott Team recommends Cantina Laredo at Grand Boulevard for a twist on authentic Mexican cuisine. This beautiful 4-story condominium resort sits directly across from the beach with breathtaking unobstructed views of the Gulf. Mediterranea features lovely manicured gardens and fountains, a heated pool and spa, community clubhouse, fitness center, tennis, underground parking and a boardwalk and gazebo leading to the beach. The luxurious 2-bedroom units feature designer interiors, master bath Jacuzzi, washer/dryer, plus multiple balconies for taking in the gulf views. Majestic Sun features 1, 2 and 3-bedroom units, plus 3 and 4-bedroom penthouse units complete with full-size kitchen, washer/dryer and stunning gulf views from spacious balconies. Amenities include a multi-level indoor/outdoor pool with cascading waterfalls and hot tub, covered parking and a fitness room. Majestic Sun is located on beautiful Seascape Resort with its 18-hole championship golf course, conference center, eight tennis courts, fresh water lakes and lovely park grounds. Ariel Dunes I and Ariel Dunes II both offer 1, 2 and 3-edroom units with private balconies, 9 foot ceilings, granite kitchen countertops, and convenient beach access to over 2,000 feet of crystal-clear emerald green waters and dazzling white sugar sand beach. Ariel Dunes I is home to a pair of spacious pools, fitness center, on-site arcade and a pool-side casual dining at Cabana Café. Avalon Dunes is an upscale, gated, low density Gulf front condo development with only 16 spacious units. Avalon Dunes condos have private beachside balconies, Jacuzzi tubs, gourmet kitchens, ten foot ceilings, the latest appliances, and elegant features. This rental-restricted building also features a swimming pool and hot tub. The Crescent features elegant units with fully equipped kitchens, whirlpool tubs, washers/dryers, a private balcony and a complimentary in-room safe. Amenities include two gulf-side pools in a lush tropical setting complete with sundeck, hot tub, gazebo and beach boardwalks. Additional features include a fitness center, game room, outside grills, conference facilities and covered parking. The Crescent is located along a bike path, so guests can rent bikes and take in the area’s natural beauty via two wheels. 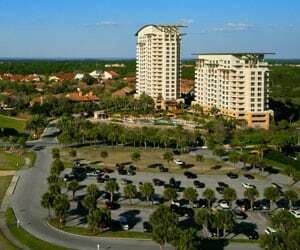 Grand Dunes Resort is made up of two towers, Grand Dunes and Grand Dunes II. Grand Dunes consists of 89 units and Grand Dunes II boast 88 units. Each Tower features 3 and 4-bedroom floor plans ranging from 2,330 sf to over 5,000 square feet, private beach, lush landscaping, tennis amenities, lobby with elegant informal bar and seating area, Gulf front exercise room, private owners’ conference room, free form pool with waterfall underground parking. Edgewater is a French Riviera-inspired Gulf front resort. Edgewater features a heated community pool, kiddie pool, over-sized hot tub, playground, workout facility, tropical gardens, basketball court, shuffle board court and complimentary golf. Seascape is an mix of natural beauty, grand resort-style luxury and the homey comforts of well-appointed rental condos. Seascape offers eight lighted tennis courts, five swimming pools, several bike trails, a seafood restaurant overlooking the beach, two championship golf courses and 2,000 feet of beach. St. Tropez by the Sea is a luxurious gated community of Mediterranean-style homes with Old World charm and cobblestone streets. St. Tropez is a tropical paradise with hundreds of exotic palms, lush plants and flowering foliage. The centerpiece of this unique community is a lush tropical courtyard with a 2000 square feet lagoon-style pool, large hot tub, picturesque fountains, tanning deck and private baths. Amenities also include a community deeded and gated beach access. Homes in the community are large and luxurious, most featuring around 2,500 square feet. Caribe is a gated beach-side neighborhood with Gulf front villa’s and homes. Caribe community amenities include two pools, tennis court, gated entry, brick paver streets, lush landscaping with water fountains, lake, and private beach access. At Hidden Dunes Beach and Tennis Resort is a 27-acre community with a natural setting surrounding Gulf front luxury condominiums, lakeside villas and Carolina-style cottages. Hidden Dunes provides seasonal beach service, neighborhood pools, hot tubs, tennis courts, tennis lessons and training, gas grills, basketball courts, clubhouse, wireless internet, seasonal tram service and 24-hour gated security. Sandestin Resort’s 2,400 acre property features a variety of real estate opportunities including fractional-ownership condominiums, luxury condominiums, townhomes, single family homes and luxury residences. The amenities at Sandestin include private beach access, complimentary beach services, golf, tennis, water sports, Sandestin Marina, fitness center, spa, biking, walking trails and more. The Village at Baytowne Wharfinside Sandestin is a pedestrian Village with shopping, dining, events, and entertainment. TOPS’L Beach & Racquet Resort includes Gulf front condominiums, town homes and private residences that back up to Topsail Hill Preserve State Park. This smaller development provides a more intimate setting while still providing incredible amenities. 110 name brand outlet stores in Miramar Beach across from Scenic Highway 98. If you are interested in purchasing real estate in Miramar Beach, the Nathan Abbott Team is here to guide the way. View available properties listed in Miramar Beach or contact our Buyer Specialists at 850-812-3261 to schedule a consultation.